Reaffirm a young learner's literacy and counting skills with Kaplan's collection of various magnetic letter and numbers sets. Kaplan also includes dry erase magnetic boards, jumbo magnetic letters, and sentence strip magnets. 3 years & up. 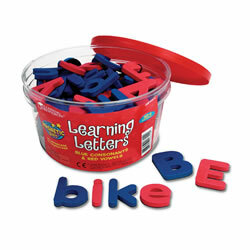 The letters in these sets are correctly proportioned and include more of the letters you need most - extra vowels: a, e, i, o, u; and consonants: b, l, m, r, s, t. Strong magnets on the back provide a "sure grip." color-coded with red vowels and blue consonants. 1 1/2" tall. 42 pieces. 3 years & up. 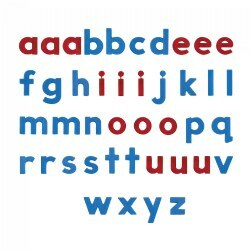 The letters in these sets are correctly proportioned and include more of the letters you need most - extra vowels: a, e, i, o, u; and consonants: b, l, m, r, s, t. Strong magnets on the back provide a "sure grip." 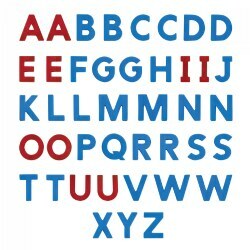 Color-coded with red vowels and blue consonants. 1 1/2" tall. 126 pieces. 3 years & up. 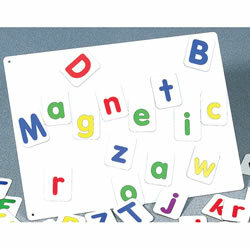 These magnetic uppercase letters are ideal for magnet play and early language practice. 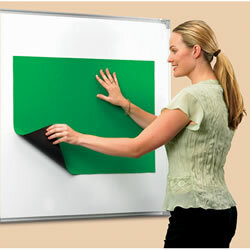 Great for use in conjuction with a magnetic chalkboard. 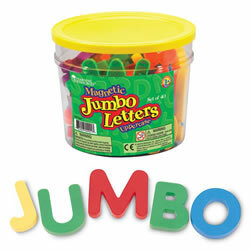 Set of 40 letters are 2 1/2" high and are packaged in a storage bucket. 3 years & up. 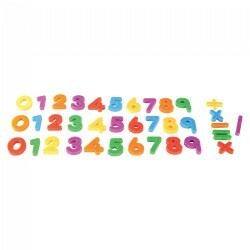 These magnetic numbers are ideal for magnet play and early math practice. Great for use in conjuction with a magnetic chalkboard. 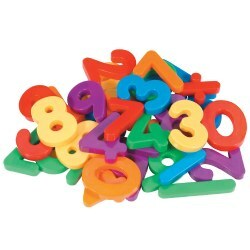 Set of 30 numbers and 6 operations are 2 1/2" high and are packaged in a storage bucket. 3 years & up. These magnetic lowercase letters are ideal for magnet play and early language practice. Great for use in conjuction with a magnetic chalkboard. 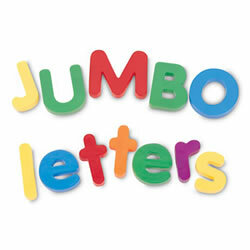 Set of 40 letters are 2 1/2" high and are packaged in a storage bucket. 3 - 6 years. Ideal for magnet play and early language practice. 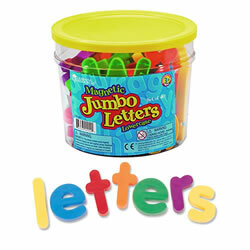 Durable, plastic letters are brightly colored and jumbo sized for little hands to easily handle. Includes uppercase and lowercase letters, each in its own reusable storage container. 3 years & up. Color-coded to differentiate consonants from vowels. 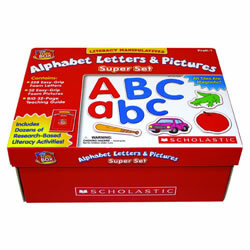 Set includes 104 letters (2 sets of both upper and lowercase letters). Approximate height of each letter is 1 3/4". Storage bucket included. 4 years & up. 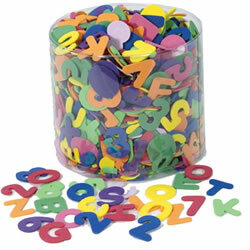 One-half pound of bright, colorful WonderFoam letters and numbers in a clear plastic storage tub. Pieces are thick enough for easy use by small hands and are made out of non-toxic material. Approximately 1" tall. (Pieces are NOT magnetic). PreK & up. 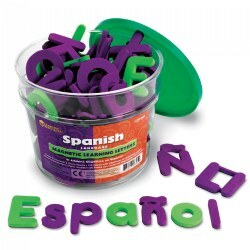 Build words in Spanish or English with these soft foam letters. Includes 120 letters featuring the Spanish alphabet. Consonants are purple and vowels are green. Raise flannel board activities to new heights with this magnetic-backed flannel board that quickly sticks to any metal surface. Surface works with felt pieces and magnetic letters, plus you can extend action from the flannel board cut onto the whiteboard. Rolls up for easy storage. Measures 20" x 27". 3 years & up. Children will love to work with these colorful magnetic letters and numbers! Introduce basic reading and math with this set of 40 uppercase and 40 lowercase letters, 30 numbers, and 6 operations pieces. The plastic pieces measure 2 1/2" high.